I have been a fan of really good Italian food for a long time as you will know if you saw my post about Perugino in West Perth and last night we headed to Jamie’s Italian www.jamieoliver.com/italian/australia/home for dinner. We had eater here about 6 months ago and on the strength of that night booked again to indulge in some good old fashion Italian food with a twist. The first dinner we had there was delicious from start to finish – the food was amazing, the staff were attentive and knowledgeable and the ambience was chaotic and fun. Last night it again ticked most of the boxes except for the service which was haphazard at best. Whilst our waiter was there to take our order and knew his specials he forgot our water twice and then when I ordered a glass of Prosecco he forgot that and had to be reminded twice. I do understand that it is a very busy restaurant but last time we were there it was just as busy and the staff managed to serve us promptly and did not forget any of the things that we ordered. The other issue last night was we had our menus and Trevor had decided to have the pork chop for his main course and duly ordered it only to be told that they did not have any. Surely the waiter could tell us of this at the start when he was running through the 2 specials on offer…thus ensuring that he then did not have to wait for another few minutes whilst another main course was selected. But enough about the service as the rest of the night was great. The feeling at Jamie’s is one of loud, happy dining and the chance to have conversations without thinking about your neighbours, this is definitely somewhere to head to for dinner to be part of the crowd. I would not be going their for a romantic dinner for 2 as the ambience is more like a food hall than an intimate dining experience. But that is not to take anything away from that as there were 4 of us having dinner and we could chat, laugh and enjoy ourselves and that works for me in this type of environment. Now to the food. The menu has not changed too much since we were last there and that is not a bad thing. The food is always fresh and they hand make their pasta fresh every morning. The menu is fun, traditional and you know you will find something that you will enjoy. For entrée this time we decided to get a meat plank for 2 and share that along with a serve of crispy tomato and mozzarella arancini that were served with pickled red chillies, spicy arrabbiata sauce and parmeson and the entrée special for the night which was deep-fried egg-plant cut like large hand cut fries and served with the spicy arrabbiata sauce. The meat plank consisted of cured meats -San Daniele prosciutto, Wagyu bresaola, finocchio & artisanal mortadella , pickles consisting of curly green chillies, green & Gaeta olives & caper berries, cheeses – Buffalo mozzarella & pecorino with amazing chilli jam and crunchy salad which was shaved root veg with chilli, lemon & mint. All of the entrees were delicious and went down a treat. The flavours were intense, delightful and the arrabbiata sauce was just spicy enough to add an intensity to both the arancini and the egg-plant. 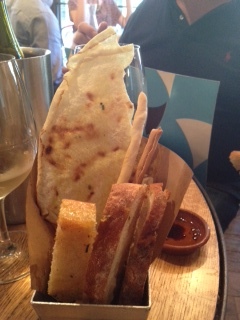 We also ordered the Italian bread selection which was served with olive oil and balsamic for dipping. It was made up of homemade rosemary focaccia (which was just delightful) , Italian grissini, crispy ‘music bread’ & ciabatta and was a nice addition to the meal. On top of that $1 from every bread tin served is donated to Jamie’s Ministry of Food Australia. Italian bread baked fresh and delicious! For main course we all had different dishes and each one of them was tasty, presented well and full of true Italian flavours. The one issue was that the main course that Trevor ordered ( I think it was his night to have issues with the menu) was really small compared to the other dishes and left him feeling hungry after he had finished it. 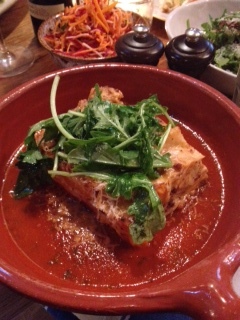 I ordered the simple baked lasagna and it was hot, full of flavour and really delicious. it consisted of slow cooked beef & pork with roasted squash, herbs & wine, baked in an oozy white sauce with tomatoes, mozzarella & Parmesan. It was a delightful choice. Lasagna that was perfectly balanced in terms of flavours! Trevor ordered the spring pea and mint ravioli, which was a small serve compared to the others but it was never the less a tasty dish. The ravioli was stuffed with ricotta, peas & Parmesan and served with broad beans, asparagus, green beans, mint & lemon & heritage potatoes. It looked impressive when served but could have been double the size to really leave you like you had had a good hearty Italian dish. 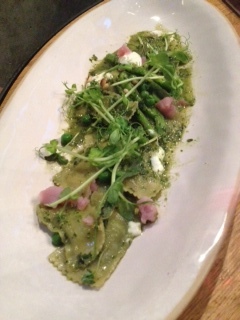 The Spring pea and mint ravioli a lovely dish but much too small! Karen ordered a small serve of Jool’s favourite Sicilian tuna fusilli, ( a dish that I had and had enjoyed last time we dined there) and she was not disappointed. Made up of albacore tuna slow-cooked with tomatoes, garlic, herbs & cinnamon with crunchy, herby breadcrumbs that all combined to let the tuna shine through in terms of taste, which can be so hard to do with fish but this was successful on all fronts. 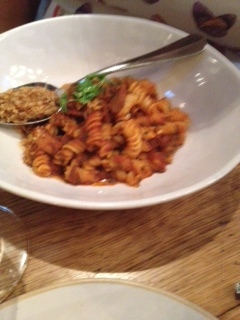 Jool’s Sicilian tuna fusilli was a delight! 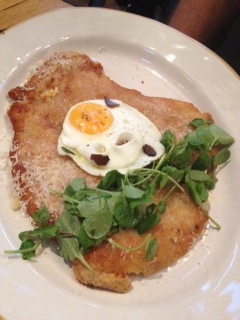 Ken had the truffled turkey Milanase which compared to the other dishes was a really large serve. Turkey stuffed with fontina & prosciutto that was topped with a soft fried free-range egg & truffles to complete it and served on a large white plate that highlighted the dish to best advantage and the flavours here were well matched and did not compete with each other but blended to create a delightful dish. Turkey Milanase yummy from first mouthful to the end! We also had 3 side dishes to go with our main meals as each meal came out as mentioned above and did not include any vegetables with them. 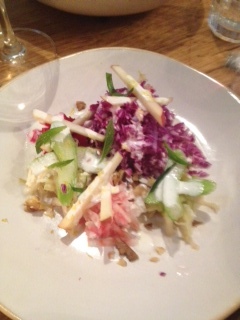 We chose the apple slaw, the rocket and radicchio salad and the crunchy salad. 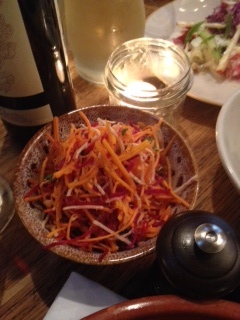 Each side dish was fresh, light and a great compliment for the main courses that we had all ordered. 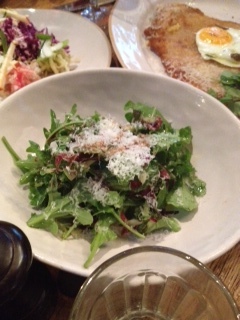 A trio of side dishes that complimented the main courses perfectly! I suppose if we were being true to the notion of dining the way the Italians do we would have had entrees, pasta and then a main course but being summer and not really eating really large meals this was not really an option and I am not sure how many people would eat the traditional Italian way for a casual dinner…but maybe I am wrong. I should make mention of the wine list at Jamie’s Italian because whilst there are a great range of options to choose from as most of the wines are imported the cost is really quite high and in this day and age is unnecessary as we have many local wonderful WA wines that could compete with what was on offer here and would bring the price down for guests at the restaurant. All in all we all had a great meal and I do love the loud raucous atmosphere here, they just need to pay a little more attention to the service and perhaps look at the sizing of some of the dishes and then it would get a much higher rating. But saying that it was packed for a Monday night and there was a second seating following us of people who were making their way in as we were leaving so they must be doing something right…I think other than the name it really is all about the food and how good it is.